Primary season is still in progress, yet this election cycle has already been one of the most rancorous in recent memory. Whether the race is about a Democrat in a Red State, a tea party challenger running against the establishment, or a tight race in a swing state, all the Senate races have one thing in common: they are expensive. 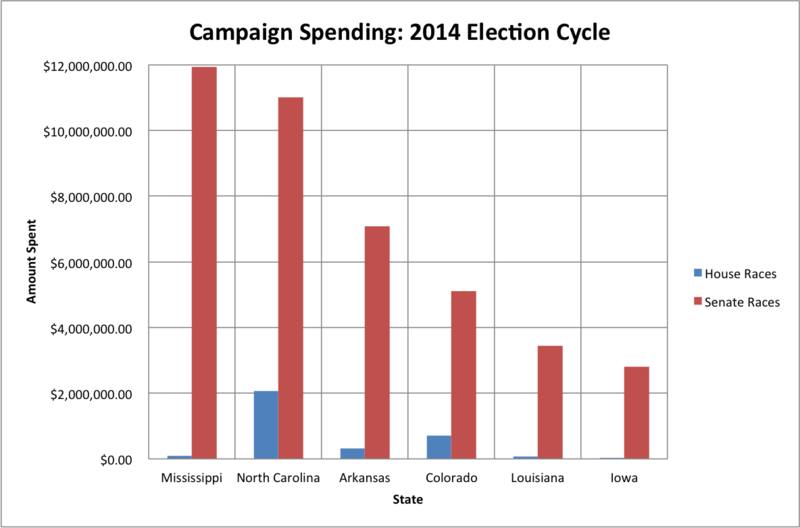 Senate races in swing states are on pace to outstrip the staggering amounts spent on the 2012 Senate campaign and have already outspent most of the 2010 races. The intensity of the campaigns for Senate seats begs an interesting question: why are Senate races so heated and costly relative to their counterparts in the House? To be clear, there are plenty of closely contested races for the House of Representatives as well, but Senate elections remain in a league of their own. The lengths that candidates are willing to go to secure a Senate seat are extraordinary—just ask Thad Cochran. To illustrate this point, the figure and table below compare the campaign spending of six swing states on their Senate and their House races. In Mississippi, for example, Senate candidates have spent 130 times more on the campaign for Thad Cochran’s seat than all four House candidates have spent on respective races. The ultimate source of the intensity of Senate races lies in the ratification of the 17th Amendment in 1913. The 17th Amendment allowed for the popular election of Senators, rather than selection by the individual State Legislatures. The Framers’ reasoning behind an indirect election of Senators was quite simple: having the state legislatures choose the Senators would allow the states to serve as a check on federal encroachment on states’ rights. According to Madison, the Senate “derives its powers from the States, as separate and coequal societies” (Federalist No. 39). By popularizing Senate elections, the 17th Amendment destroys two key facets of the Framers’ vision for the Senate. First, it weakens the Senate’s ability to represent state interests. When chosen by the State Legislature, Senators must be consensus candidates agreed upon by the representatives of every district in that State. This is especially true in “purple states” in which both parties are closely competitive for elected positions. While Senators would almost certainly be of the majority party, the minority party would still play a considerable role in the choice of Senator (much like choosing a Prime Minister in a Parliamentary System, choosing a Senator would require some semblance of a coalition). Presently, Senators are not accountable to their State Legislatures. They are accountable to party line voters and party interests. As such, popularly elected Senators can get by representing only 51% (or less) of a state’s population. Second, popular election of Senators undermines the Framers’ design for the Senate. It was meant to act as representatives of the States to the federal government—not the direct representatives of the people. States were supposed to be able to place a check on the federal government through the Senate. The Senate is also the avenue by which the states are able to engage in foreign policy. Because the individual states are not sovereign entities, they cannot engage in foreign policy of their own. Selection of Senators by the state legislatures, however, gave the states a powerful means of shaping the foreign policy of the United States. The Senate must ratify treaties and confirm the President’s appointment of ambassadors and cabinet members (i.e. the Secretary of State). By removing the state legislatures from the electoral process, the 17th Amendment made Senate elections about which party controls the more powerful house of the national legislature. Party control of the Senate means party control over the confirmation of presidential appointees and ratification of treaties. Representing the interests of the individual states becomes a secondary priority. The amount of money that parties and PACs spend on Senate elections versus House elections reflects this fact. Tags: Campaign Spending, Congress, Senate. Bookmark the permalink. Previous post ← Why Is The EU Running Off With Our Chianti And Parmesan?